NEW DEALER REPORT: Where are dealers finding the highest ROI in their digital ad spend? 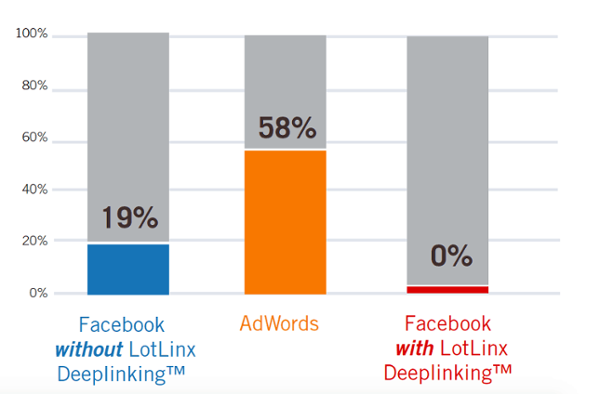 Last month, LotLinx concluded a 30-day study of over 100 dealers across the United States who were using both AdWords and Facebook as a part of their digital strategy. This dealer report was conducted by our resident Google Analytics genius, David Salinas and his team of analysts from March 26th through April 25th, 2016. This report is a great way for dealers to benchmark their own performance versus that of other dealers who are also leveraging AdWords and Facebook to drive traffic to their websites. Dealers driving traffic from Facebook on their own or through digital agencies saw only a 9.8% VDP goal completion rate, vs. 21% from AdWords. 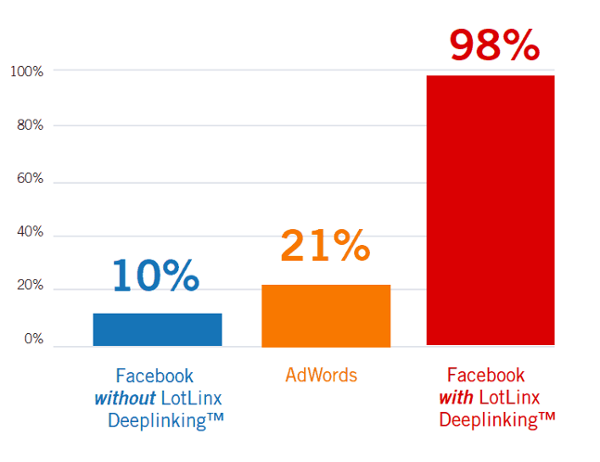 Dealers using LotLinx Deeplinking™ for Facebook, however, saw a VDP goal completion rate of 98%. Facebook traffic (without LotLinx) is spending an average of 80 seconds on a dealer’s site, vs. 160 seconds when they come from AdWords. Facebook traffic from LotLinx is spending 50 seconds on the dealer’s site. However, the longer time on site from AdWords traffic is likely due to the fact that dealers are using AdWords to primarily drive visitors to their home page, as evidenced by the next chart. Dealers are using AdWords to drive visitors to their home page. Of the dealers on AdWords, 58% of them had their home page as the #1 landing page, versus 19% of the dealers on Facebook. None of the dealers receiving traffic from LotLinx Deeplinking™ for Facebook were experiencing their home page as the top landing page. 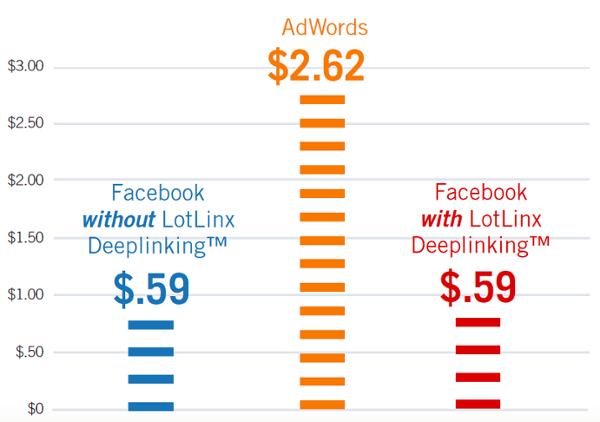 Dealers are paying an average cost per click on AdWords of $2.62, that’s more than 4 times the cost of $0.59 on Facebook (whether using Facebook with or without LotLinx). While costs per click are certainly important, what matters are conversions. Given their low VDP conversion performance on AdWords, dealers are actually paying $11.31 per VDP conversion from AdWords. 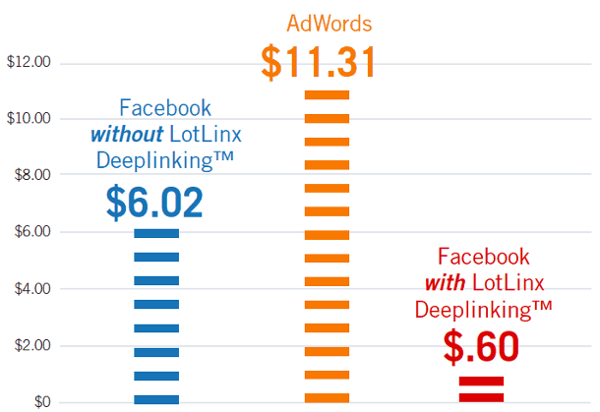 By switching to Facebook, dealers can lower their cost per VDP conversion to $6.02, but can do 10x even better than THAT by enrolling in LotLinx Deeplinking™ for Facebook. If you’d like to see more information, such as percentage of NEW VISITS, BOUNCE RATE, and CPC recommendations, download the full report on how your fellow dealers are doing on AdWords and Facebook.